Last Saturday night my sister-in-law, Jenn, and I hosted our first fundraiser for the 2012 MS Challenge Walk. In September we will be representing The Bean Team by walking 50 miles in 3 days on Cape Cod. My mom and I have been members of the crew for the past 2 years and last year Jenn and my cousin walked. To read about that go here. After the 2011 walk Jenn stated, "It really wasn't that bad." In a moment of craziness euphoria I decided to walk in 2012 and there is no turning back now. . . We each have to raise at least $1,500 to participate so this event is just one way we are raising money. Jenn and I both love The Paint Bar. It is an awesome addition to our area and I've been twice before. I went for the first time last March right after they opened to celebrate my birthday. Read about it here. Jenn and I went again with our moms to celebrate Mother's Day. Read about that here. For our fundraiser, Jill and Jackie, the owners of The Paint Bar, agreed to donate $10 for each person we got to sign up (but then ended up giving us $10 for all the people there)! In addition we did a 50/50 raffle. My aunt, Cathy, was kind enough to donate her time to come to the event to be the official raffle ticket seller and photographer! I was very appreciative to her for this so that I could focus on my painting. She sold a lot of tickets. . . $200 worth (more about the winner later). We also had a MS info table and a dessert table. The Funfetti cupcakes were a big hit! Several of my family members and friends came to the event. We painted a winter scene of Make Way for Ducklings. The Public Garden is one of my favorite Boston landmarks and I had been looking forward to painting Make Way for Ducklings for months. The Paint Bar classes always sell out. They have room for 50 people and about half the people there had signed up for our fundraiser. The other people didn't know about our fundraiser until they got there but many were great and supported our cause by buying raffle tickets! Did I mention that The Paint Bar is also a bar that serves beer and wine!? Yup! So not only do you get crafty but you can drink while doing it! They also play fun music. . . I think they need to add the country song "Red Solo Cup" to the playlist in light of the famous red solo cups that are the paint brush rinse cups!! 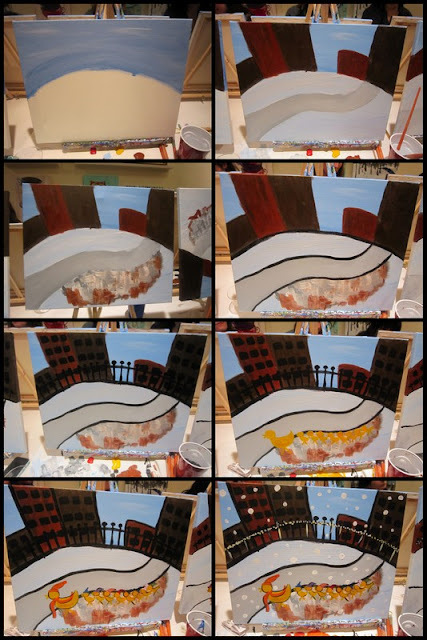 Here are the finished paintings! Amazing right!? I love how they are all similar yet so unique at the same time. Nancy (bottom right picture in black jacket) is an art teacher and artist and make had a beautiful interpretation! But really I think everyone's looked great. So fun to see what everyone did at the end. I love walking around and checking all the paintings out! Just because I know many of you are saying, "I could never do that" I took step-by-step painting pictures so you could get an idea of how they "teach" us to do the painting. They really guide you every step of the way and will help if you get stuck. They tell you everything from which paint brush to use, which paint color or colors to dip it into and where to paint on the canvas. The whole time the teacher, Jackie, is painting one along with us in the front of the room. 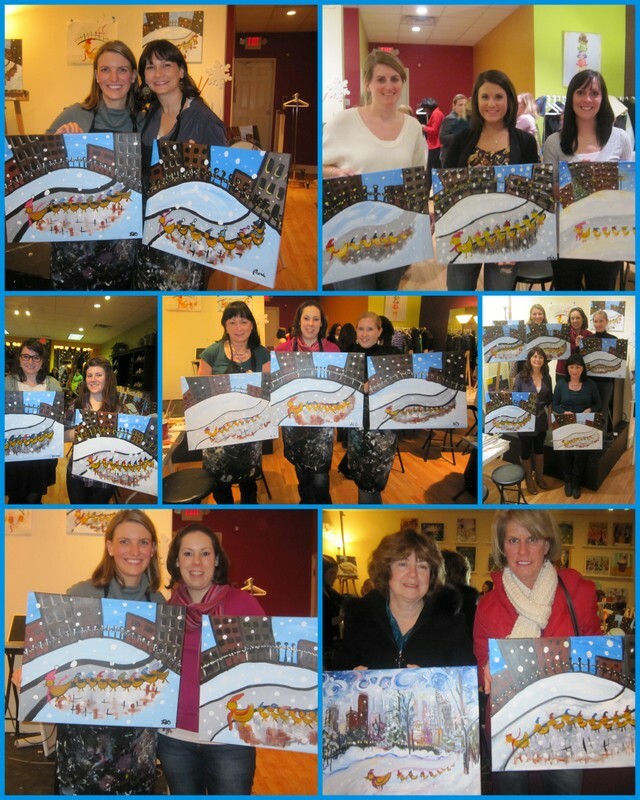 It really is a great night out with friends and I highly recommend The Paint Bar if you live in the Boston area. And the fundraising results. . . 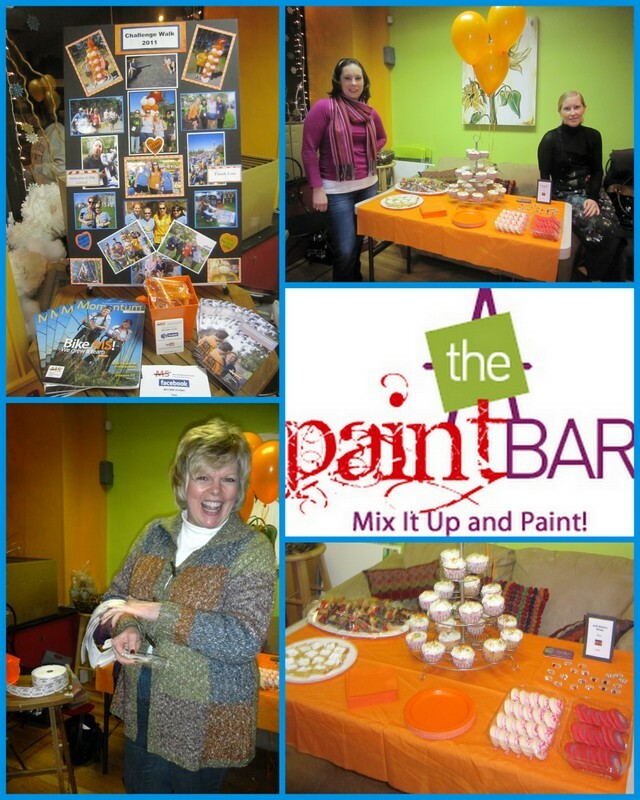 The Paint Bar donated $450 which was $10 for each person there. So Jenn and I each got a check made to the National MS Society for $225. Then (as I mentioned earlier) the 50/50 raffle earned $200 which would mean the winner would get $100 and Jenn and I would get $50 each. BUT the amazing winner, Tara, who is a friend of one of m co-workers (who couldn't make it to the event at the last minute but her friends/family still came) donated her winnings back to Jenn and I. AMAZING right!? I was in shock. I just was so touched that someone that I didn't know and had never met would be so kind to us. I mean 100 bucks is a lot of money. She could have used that money for so many things. It was her right. She won fair and square. But no she gave her winnings to us. To MS. Wow! So touched by her thoughtfulness. Not sure if she will read this or if she even knows I have a blog but thanking her 1000 times anyways! So in total Jenn and I each made $325 toward our fundraising efforts. This was a VERY successful fundraising event. $650 raised while doing something so fun! If you are ever looking for a unique fundraiser in the Boston area I would definitely suggest The Paint Bar. Jill and Jackie are wonderful to work with and your guests will have a great time. Jenn and I have a couple other fundraisers in the works including one with Willow House and one with Stella and Dot (my cousin Katelyn is a stylist making it even better). So I'm confident that by September we will have exceeded our goal. If you would like to donate to me I would greatly appreciate it. 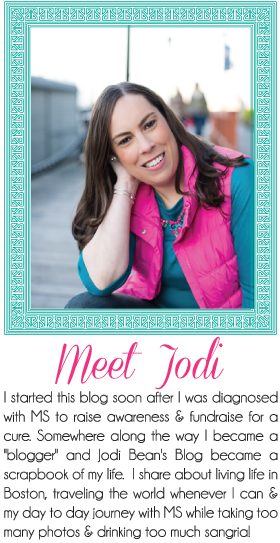 You can do so by going to my personal page at http://main.nationalmssociety.org/goto/JodiBeanCape. Today I'm linking up for the first time with Life After I "Dew" for So What! Wednesday. Here's what I'm saying so what to this week! if I had to have even more blood work done (and got stuck 3 times before she found a vein) for more food allergy test for things like carrots, almonds, eggs and the list goes on and on and on. . .
What are you staying So What to? 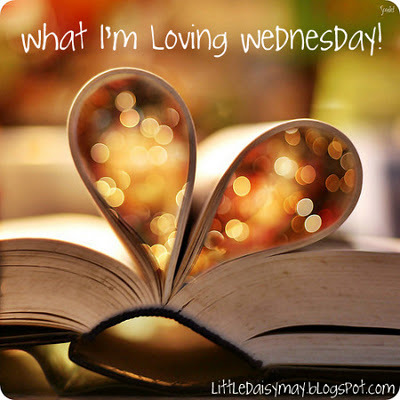 I'm also linking up with Jamie for What I'm Loving Wednesday. My Facebook and Twitter friends probably already know how much I love the iPhone game "Words With Friends." Well my opponents also know how terrible I am at this game. So just to prove that every once in a while I do come up with a good word I took these pics. . . I was pretty excited when I made the word "jots" for 99 points but then a day later I was even more excited when I made this word. . .
"zone" for 102 points! Yay me! I've continued to lose often since then but I'll live off these two great words for a while! That is all for now. . . will try to blog again soon. Did you make a resolution to volunteer for a great cause in 2012? Did you make a resolution to exercise more in 2012? Did you make a resolution to raise awareness for a great cause in 2012? Did you make a resolution to do something fun in 2012? Did you make a resolution to raise money for a great cause in 2012? Did you make a resolution to support a friend in 2012? I have a way that you can accomplish all of those resolutions at once! Join me at the Boston MS Walk on April 1, 2012 and walk 3 miles to raise awareness about MS! I'm hoping the team will be even bigger than last year! The Bean Team raise tons of money for MS! Oh and guess what? The Bean Team already has one new member mascot. . . 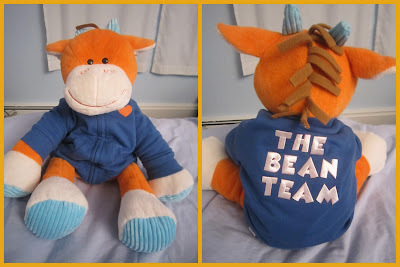 I got this little orange cow for Christmas and looks like he is a proud member of The Bean Team! I can't believe I haven't blogged since January 3rd. . . well actually I can. If you knew about half of what I've been dealing with you would understand the blogging hiatus! Let me try to update you about my life while trying not to vent/complain too much!! On Saturday, January 7th my laptop crashed. Like dead. Would not work at all. Cue freak out here. I was super stressing since I have all of my private practice work/notes on it and needed to get a report for a case asap. Great timing! Luckily I have a wonderful IT guy at work who I could pay to fix it (for a small fee) during his free time. To make a long boring story short I finally got it back on Tuesday night and so far so good. It had a bad virus but he cleaned everything off and I'm starting fresh (reloading iTunes, all my pics, documents, etc). Thankfully I had a back up which if you don't have I HIGHLY recommend! I would be devastated to lose all my pictures and music. Next up I need to learn how to back up my blog! At the same time my laptop was being repaired my car was in the shop. Forever. It took over two weeks but I am happy to report that I got my car back on Tuesday night too. I don't even know the damage bill yet because my wonderful father paid it and now I'll make monthly payments to him. The who car "situation" has been very frustrating and stressful. I'm hoping it is fixed completely now and that I won't have any other problems with it for a LONG LONG time! I've had a headache since January 3rd to be exact. Yup you read that right. I've had a constant headache for 2 weeks and 2 days! Good times. I finally saw my neurologist on Tuesday (Tuesday was a busy day) and he diagnosed me with migraines. The last time I saw him in October 2011 I had reported an extended headache so after putting it all together he figured out that I've likely been having migraines for some time. Just add this to my long list of health problems. So he started me on a medication which will hopefully prevent the migraines. Bad news is that I have to start on a low dose and work my way up so it will take a while to know if it is working. In the meantime I STILL have a headache (luckily much less painful then it has been). As I've mentioned in the past I do some work outside of my main job. Currently I'm doing "supervised visits" for families that are court mandated. I have several cases going on and that alone was stressful because I've been working 7 days a week for several months. It is just too much! I've been wishing that something would change and trying to figure out how to make that happen and then. . . after a couple of "events" with one of my visitation cases I made the decision to resign as their supervisor. I can't go into any detail due to confidentiality but let's just say I think it was a very good decision. So now I will only be working 6 days a week - which I realize is still a lot but at least I get one day off! On another supervision case (that I did over the summer very briefly) the attorney send me a subpoena with no notice. I was shocked since I've had no contact with this case since August. I sent him an email telling him I thought it was unprofessional to give me such little notice and he responded via emailed and used the word "lambaste" which I thought must have been a type since I had never even seen the word let alone know what it means. After some googling I figured out that he wasn't too happy with me. The feelings were mutual. I didn't end up needed to appear in court that day but still waiting to hear if I might be needed in the future. Fingers crossed that the family settled. So as you can imagine all this stress has not been good on my mood. I've been an emotional mess! Yup I'll admit it. January has not gotten off to a good start for me and I'm hoping it is not an indicator of how 2012 will shape up! I have a lot of exciting things planned for 2012 and I'm hopeful that it will be a great year. Maybe I got all the bad stuff out of the way in January and am done. Let's hope! Sorry for the super boring blog post. I promise to have happier things on the horizon! 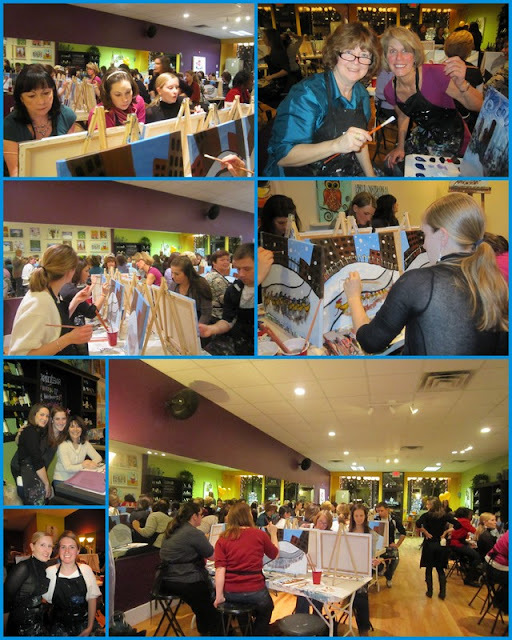 Our MS Fundraiser at The Paint Bar in this Saturday so I'll be sure to do a recap about that! I'm very excited for it. 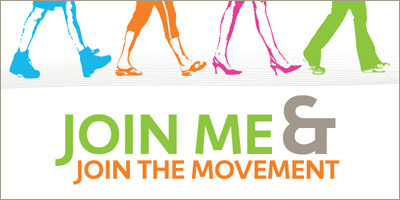 Also more info coming soon about joining The Bean Team for the Boston MS Walk on April 1st! Last Wednesday I had surgery on both feet. I had to have the screw in each foot removed. They were there from previous surgeries. 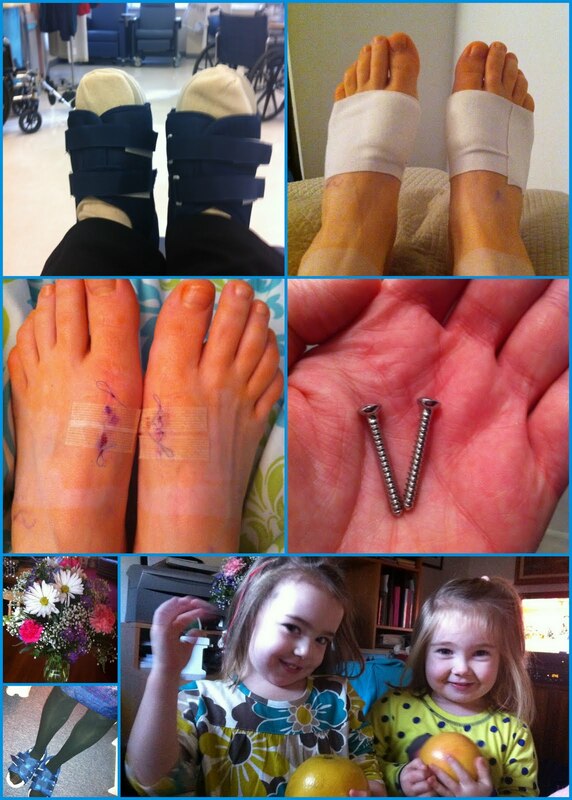 I had the first surgery on my right foot 2 years ago and I blogged about that here. I had the first surgery on my left foot in 2002. Both surgeries were worth it and I have been pain free until recently. My right foot was giving me pain first and it was recommended by my doctor that I have the screw removed. They the left foot was bothering me a bit too so I figured I'd get them both out at once and hopefully this will be the end of my pain and surgeries! The recovery has been very easy compared to the former surgeries. It was great that I had a week off to take it easy. I did stay at my parents' house the night of my surgery and my nieces came to visit the next morning. They were very concerned and wanted to cheer me up (with grapefruits)! Ha! I showed them the screws that came out of my feet and they were very impressed. My grandparents sent me beautiful flowers which was very nice. I got to wear some fancy shoes for several days and even got to dress them up on New Year's Eve - good thing they matched my dress! I got the stitches out on Tuesday and I'm wearing flats to work and feeling pretty good. No pain at all in my right foot and some minor pain in the left. According to my doctor he had to "dig" and remove some bone to get the screw out. Nice! Cooper, the pet therapy dog, at my work made the newspaper again! I blogged about the first time he was in the paper here and today it was on boston.com which is the online version of The Boston Globe. You can read the article here. 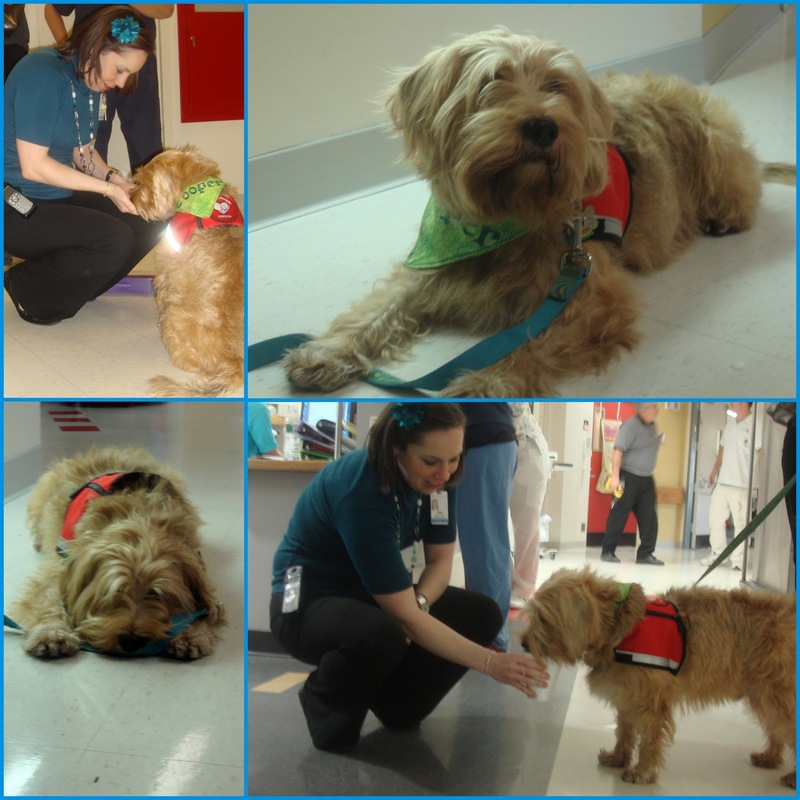 Cooper has been such a welcomed visitor at the hospital and I'm so glad everyone is enjoying the pet therapy program so much. In other news. . . my upstairs elephant neighbor and her boyfriend are VERY loud. I don't know if they are just really rude and disrespectful or clueless. Either way it is annoying to me. Oh and she is ALWAYS home like as in I don't think she works or EVER goes out! So I've been debating writing a note for some time and I likely will as soon as I have time. I think I will go with the nice approach and assume that she doesn't realize that it sounds like they are coming through my ceiling! We'll see if it helps. . . wish me luck! Oh and just in case I haven't mentioned before I really dislike how expensive the dentist is even WITH insurance! I'm STILL paying off my crown and have one more payment next month. I was making such great progress with my credit card until I got slammed with $200 copay for my surgery last week and $300 payment for the crown today. Ugh! I think I should marry a dentist. They MUST make great money!! I have nothing exciting planned this weekend. It is the after holiday let-down. January is looking like a boring month for me. Just hoping it stays SNOW FREE in Mass! 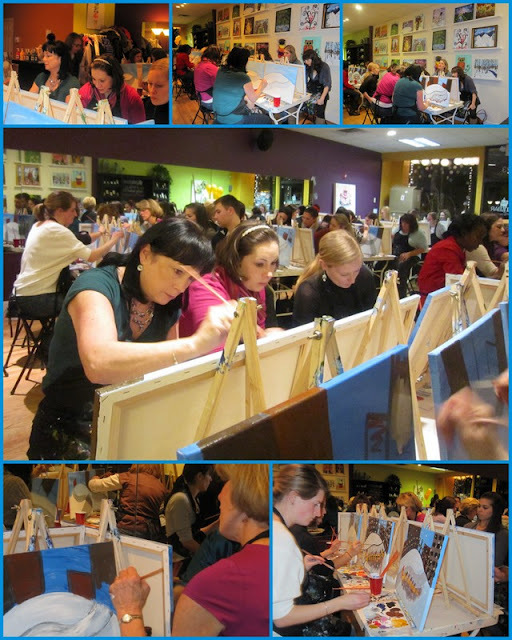 I am looking forward to our MS Fundraiser at The Paint Bar. Have you signed up? What are you waiting for? Well now you should be all updated about what has been going on with me. I know - exciting stuff! Hope everyone is having a good week at work! I love Christmas for the real meaning of it all but I'm not going to lie. . . I love it for the presents too! I love giving presents to my family members and I love getting them in return! 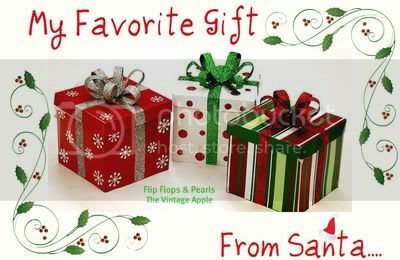 Today I'm linking up with The Vintage Apple and Flip Flops and Pearls for "My Favorite Gift From Santa." Although I'm not picking just one. . . here are several of my faves! My aunt bought me this cheese plate on the Cape this summer. Randomly one day I got a text asking me my favorite flower. I thought she had sent the text to the wrong person so clarified and indeed it was meant for me. Didn't even know it at the time but I made it so easy for her considering hydrangeas are everywhere on the Cape! Love my plate!! My parents got me this great Silpada necklace. My mom actually bought it after I mentioned I liked it at the MS Challenge Walk back in Sept. I didn't even remember it but luckily I still like it! My aunt bought me this beautiful scarf in Barcelona on one of her many adventures. I love the color and look forward to wearing it to work! My parents got me this and I'm thankful b/c I REALLY needed a new can opener (my hand is very appreciative of this gift). My aunt is very hip and got me this gift. I hadn't even heard of it prior to Christmas but now that I have one everyone is talking about the Clarisonic! So far I love it and hope it helps my skin! I can't wait to go shopping. My sister-in-law and the family I babysit both got me giftcards to lululemon and I can't wait to buy some yoga pants! My parents got me this Vera Bradley bag. I actually don't own any Vera Bradley bags so this is a nice addition to my bag collection. Another thing that I mentioned MONTHS ago and my mom remembered and got it for me! I'm also appreciative of the "green paper" gifts I got from my grandparents and parents. I look forward to shopping as soon as I'm back on my feet. Top of the list is an Oral B toothbrush (boring but necessary) and of course I'm sure I'll find some new clothes that I HAVE.TO.HAVE! Christmas was so much fun and I love all my new stuff! Thanks everyone!! So long 2011. . . hello 2012. Let's make it a good year with plenty of good health and much happiness (and an iPad wouldn't be so bad either)! Last night Emily and I rang in the New Year at Erin and Eric's house. It was a nice low-key get together which was just perfect considering my "feet situation." We had a great time eating lots of yummy food and playing the game "Apples to Apples." We enjoyed several "raspberry fizz" champagne drinks and toasted to 2012 as the ball dropped over New York City. AND I'm happy to report I was home in my bed soon after midnight. Ha! I hope you had a wonderful New Year's Eve and are looking forward to great things in 2012.